At the end of this week, we have that great holiday of Halloween. So, if you are looking for something to do almost last minute that isn’t just going house to house for candy, then hopefully this guide will help you come up with some ideas. Most of my suggestions will be Halloween oriented, but there are a few that aren’t. And, as always most will be outside suggestions. One great place to look for events is the National Park Service’s event calendar. The calendar won’t always include every event because individual parks add pdf flyers to their specific site and these are unsearchable. For Texans, there are 12 National Parks listed in under the NPS calendar. I only found 2 parks having events on the 31st. On the 31st, Padre Island will be having 3 events. First thing in the morning there will be a birding tour, after lunch there will be a birding skills class, and after will be an afternoon birding tour. While, not in the spirt of the holiday, these events are early enough in the day to attend and then move on to more traditional fun. If you are in El Paso, there is 1 event available on the 31st. If you love Shakespeare, check out Hamlet at 7:00 PM in the park. If you want to stay with the Halloween theme, then go dressed up as your favorite character. No luck finding an event in a national park? Then check out the Texas Parks and Wildlife Department’s event calendar. There are 9 parks with activities happening on the 31st, so make sure you check and see if a park near you has an event. These events range from battle reenactments, night hikes, pumpkin painting, to campsite trick or treating. No park or event in your area and you are still looking for something to do? Well if you like haunted houses, then there might still be hope for Halloween. You can try using find a haunt to locate a haunted house in your area. This website allows you to search by city and state or zip code. Make sure you check it out and go get scared! Another option for a scary Halloween night is a haunted trail. Unfortunately, there are only three that I could find in Texas, but if you live by one go check it out. If you live in Houston, The Haunted Trails are in your area. For folks in El Paso, check out the TexasTerror Trails. The Terror Trails also include a paintball adventure where you can shoot some zombies. Finally, if you are in the Dallas area, Haunted Shadow Lake Trail is the haunted trail for you. If you are lucky enough to live by a haunted trail, I am completely jealous. Please go and let me know all about it! 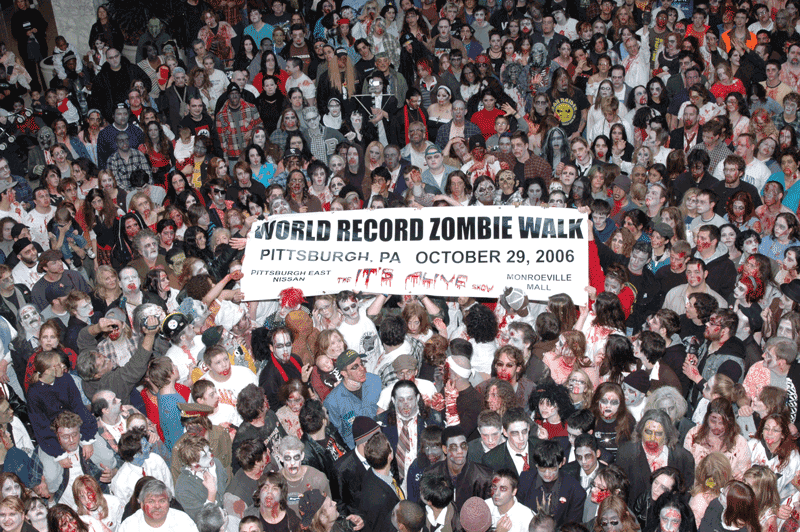 One final suggestion, try searching for a zombie walk/run for Halloween. A lot of cities and towns have zombie events where a lot of people dress up like zombies and act like a hoard together. While I couldn’t find a site with multiple listings, just use Google and I’m sure you will find a zombie walk in your area. Let us know all about your big Halloween plans. Also, if you enjoy the blog, please follow us on Facebook. How does BeeGee behave around people with costumes? Last Halloween she didn't seem to mind anyone in a costume, but some times she will bark for a little bit at people off in the distance at night.